Adulting doesn’t have to be boring. There’s always room for some play and exploration in things that, on the outside, seem very square and buttoned up. Food waste, for example, just feels so technical, so not fun. After my post earlier this month about keeping food waste at the forefront of my mind, I’m happy to report it’s still there, popping up when I’m meal planning, cooking, or eating. And while it feels like it could be daunting or restrictive, it’s more fun than I thought. It’s another challenge I think about (like my how do I add more veggies to this meal challenge) as I stare in my fridge. How do I take this leftover kale and make it something different and more fun than my go-to sautéed goodness? What else could I add to it to make it more fun? This week, more fun was pesto. Pesto, as I’ve made and said many times before, is not just for basil, no, no, no. 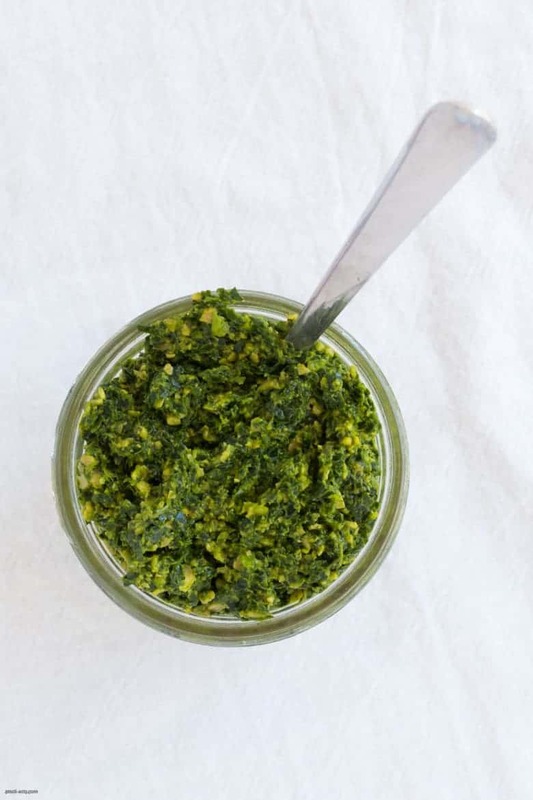 Pesto is for whatever greens and nuts/seeds you’ve got. I had a bunch of slightly wilty kale, a handful of beet greens and freezer full of nuts and seeds at my disposal. I chose pumpkin seeds, cause why not? What I now have is a great spread, dip, sauce to stir into pasta or toss a greens or grains salad in. I could dress a pureed soup with it. If I don’t use it all, I can freeze it in my ice cube trays and enjoy it later. It uses what I have, saves me money, and mixes things up in the kitchen with pretty minimal effort. Win, win, win, all the wins. 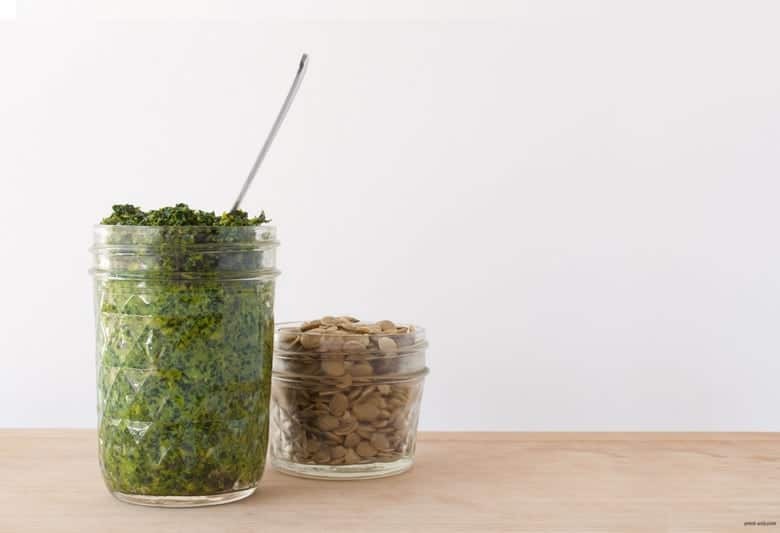 You can easily make this pesto with whatever greens and nuts or seeds you have in your kitchen too. Have too much spinach? Maybe you just want to so something fun with your Swiss chard. Those walnuts been hanging out in your freezer for a little bit? Make it your own and have fun! Food is fun, and so can being adult and cutting down on food waste. Combine greens, seeds, garlic cloves and seasonings into food processor. While running, drizzle olive oil through feeder tube and run until the desired consistency is reached. You could add more or less olive oil, depending on your preference. You may need to stop the food processor periodically and scrape down the sides to make sure the seeds get processed all the way. Store in an airtight container and use within a week, freeze leftovers in ice cube trays and thaw as needed.